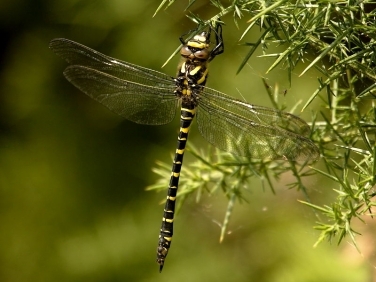 British dragonflies: what’s that yellow striped dragonfly? 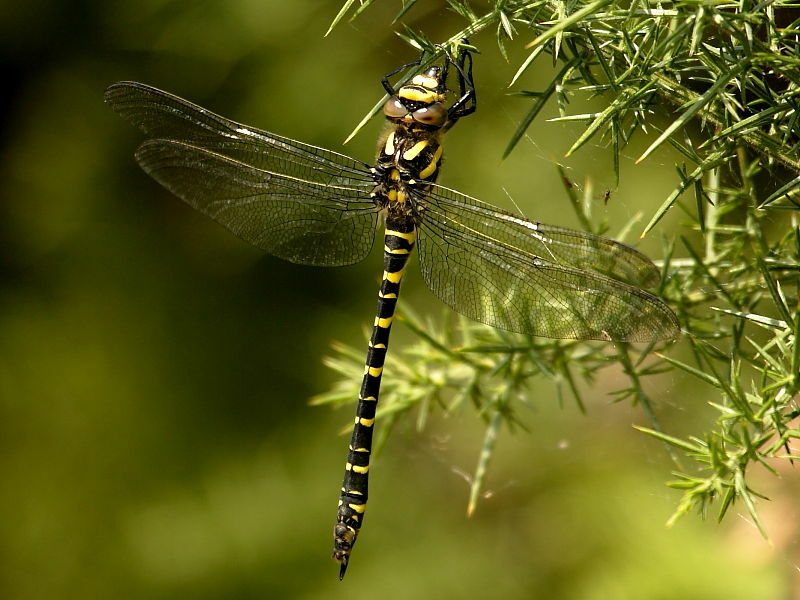 The Golden-ringed Dragonfly is one of the easiest British dragonflies to identify. 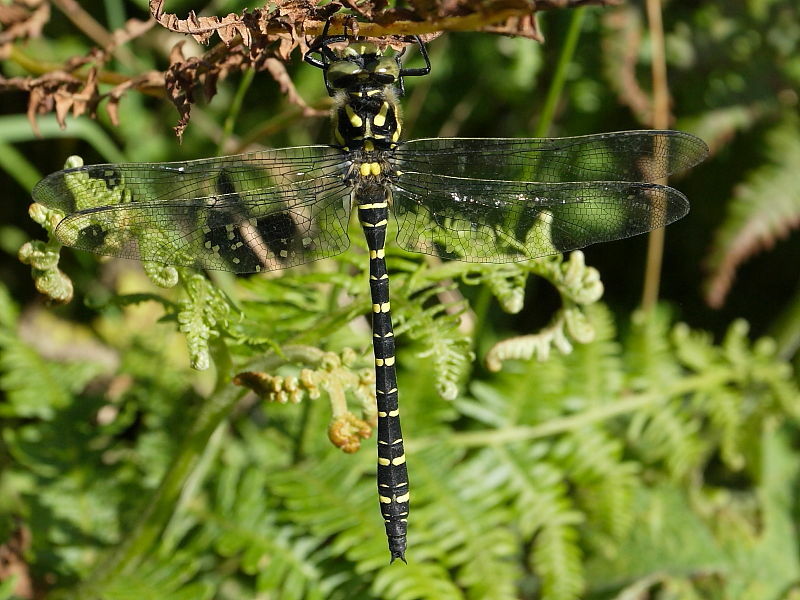 With a main body length (abdomen) of between 54-64mm it is one of the largest dragonflies likely to be seen in the British Isles and no other British species has the dramatic yellow bands on the abdomen, after which this dragonfly appropriately derives its English name. 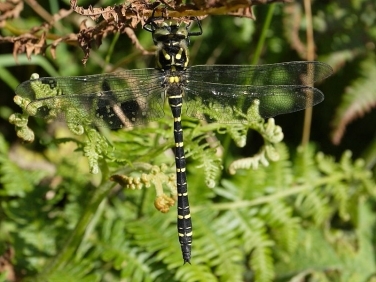 The female Golden-ringed Dragonfly pictured was spotted at the weekend hunting insects around the second World War gun emplacements on sea cliffs at Pendennis Point, Falmouth and the male was seen amongst ungrazed grassland beside the South West Coast Path at Portscatho on the Roseland Peninsular. Not only is identifying the Golden-ringed Dragonfly easy but when seen perched it is also possible to determine its gender. 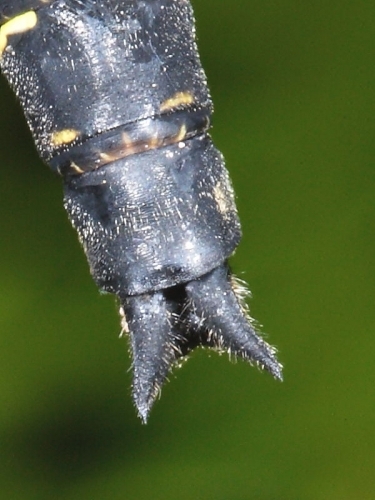 The males have a slimmer abdomen with a club end compared to the females thicker and more uniformally wide body. The male’s claspers are also very distinctive in comparison to the long oviposter of the female that she uses to penetrate the ground and mosses at the edge of streams to deposit her eggs. 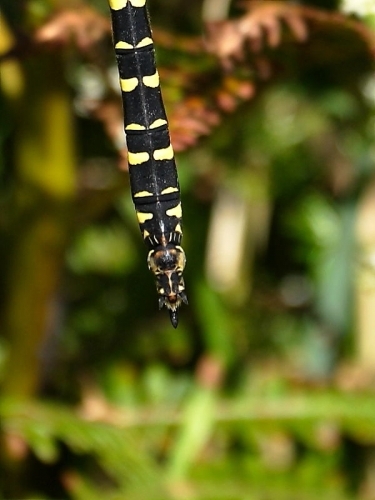 The long, straight and stout oviposter of the female Golden-ringed Dragonfly is very different to those of other dragonflies and towards the end of the laying season may become damaged and the tip of her abdomen discoloured by coming into contact with soil and gravel substrates. Wildlife Insight into the life-cycle of Golden-ringed Dragonfly (Cordulegaster boltonii) :commonly found on moorland and heathland throughout most of the south, north and westerly half of the UK the Golden -ringed Dragonfly fly between June and September. The females lay their eggs beside overgrown and often acidic, small, fresh water streams in which the hatched larvae may live for up to four years. The males will patrol long stretches of streams, fending off other males and looking out for females to carry off and mate with. Both males and females hunt a diverse range of insects and will pluck them both off vegetation or out of the air, often landing on bushes to eat them.